BPS version 2016 introduced new functionalities which allow simple integration with external service providers. The integration is conducted through the usage of API (Application Programming Interface) supplied by third party vendors. Through action invocation – data provided in form fields can be used for handling operations in an external system e.g. 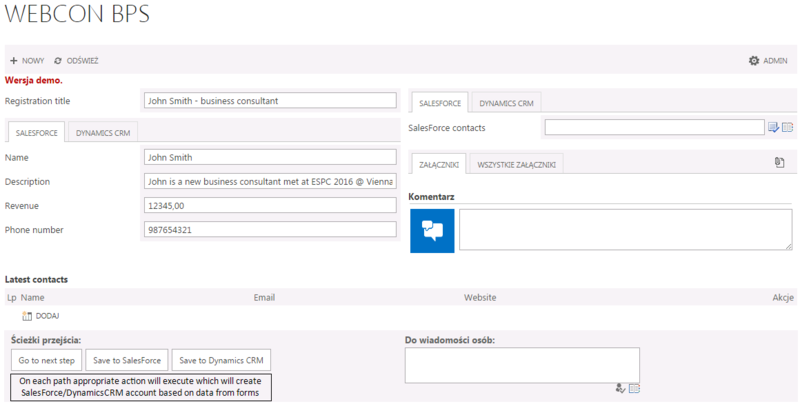 creating an account in Dynamics CRM based on input provided by the user on the form. 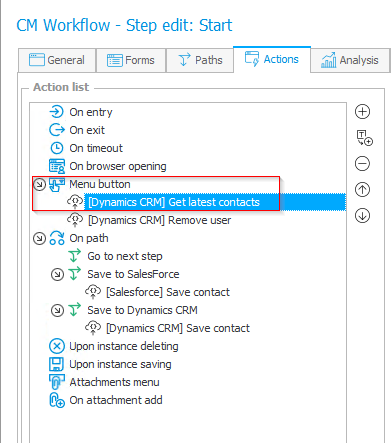 Ability to automatically create a new account in Dynamics CRM and/or SalesForce for newly registered contacts (e.g. while moving between steps) based on the data entered into the form. Ability to then use the pool of existing accounts as a data source for a Choice field – selecting one of them will automatically populate the form with information about the chosen contact account. This particular case presents how two-way communication from/to our system works. 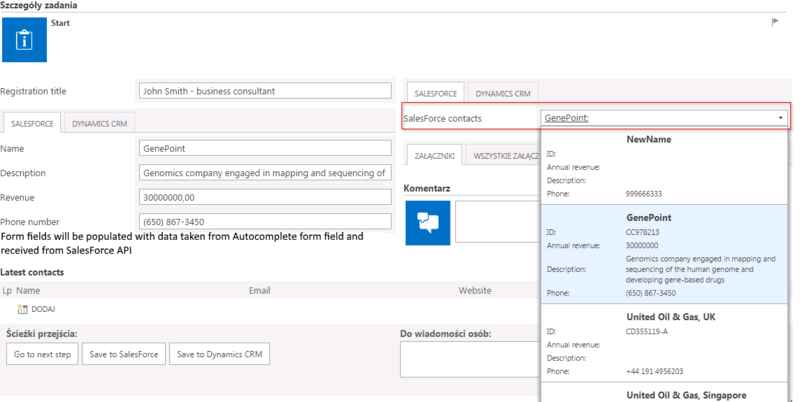 The configuration presented below that allows the fulfilling of aforementioned requirements in the context of Dynamics CRM and SalesForce API. Details concerning the queries which are connected to the knowledge of vendor API documentation as well as HTTP protocol usage will not be covered in this article. A data source is be added which will return all existing accounts created in the SalesForce system. Due to a rather big data set returned for the Account object (it has quite a lot of properties) only several columns will be selected such as: „AccountNumber”, „Name”, „Description”, „Phone”, „AnnualRevenue”. The data source will be used in Choice field type form field. After selecting specific account other form fields will be populated with its data (explaining this part will be excluded from this article). Data source configuration for SalesForce API – fetching all existing accounts. 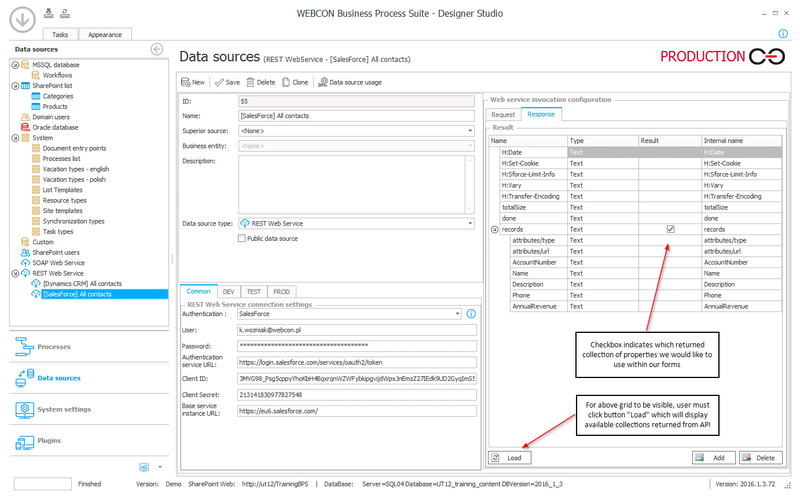 Data source configuration – selecting a resource (Account) from which specific object properties will be fetched. REST Data sources usually use GET method from HTTP protocol. Due to their concept, they are mostly used for holding data which are accessed/read via form fields (choice fields, SQL grid, charts etc.) on user’s forms. Usage of REST data source on forms – Autocomplete form field aggregates data returned from SalesForce API and populated other form fields. A new action will be added which will create a new SalesForce account upon its invocation. This Action will be executed after choosing the appropriate path on the workflow instance. It will collect data from form fields in the “SalesForce” tab panel, and based on the found data it will generate an HTTP Request to the external system (SalesForce). 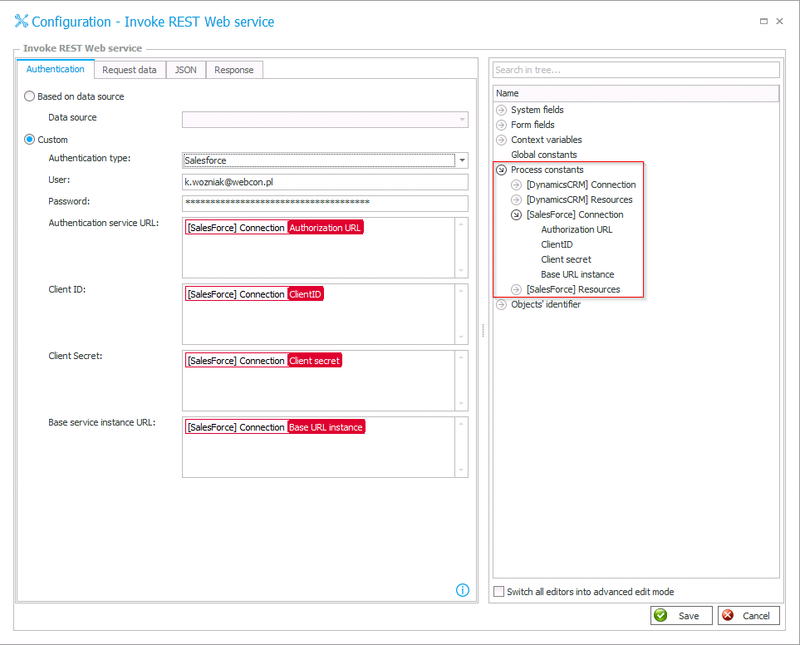 REST Action I configuration p.1 – Configuration of authentication settings with the usage of the process constants holding actual connection data. REST action I configuration p.2 – Choosing HTTP method as well as pointing to specific API Resource where we would like to create a new object – using process constants holding actual resource name. REST action I configuration p.3 – request body in JSON format, holding data which will be used to create a new object in the external system (here: an account in SalesForce). REST action I usage – Data was entered into form fields in the SalesForce tab, then the “Save to SalesForce” path was clicked, triggering an actual call to API and creating a user account. 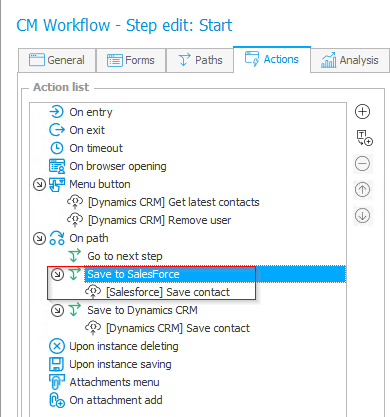 REST action I usage effect – New account created in SalesForce with data taken from BPS forms. 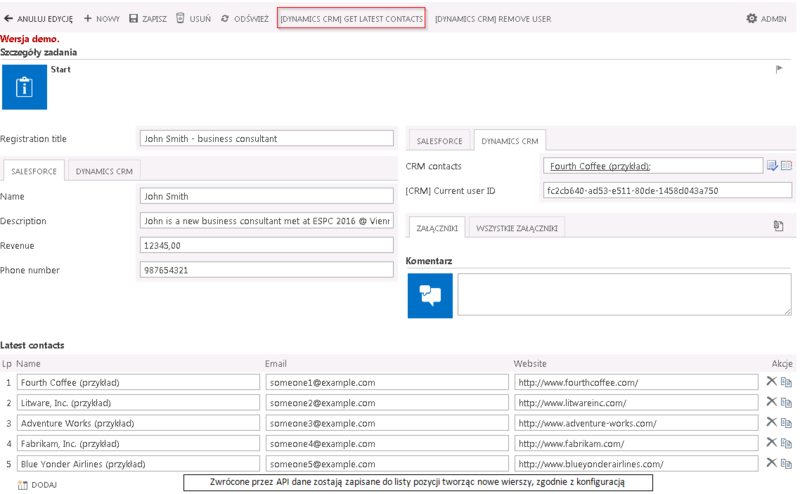 Action will be added which will run on demand (menu button on the form) and fetch data of five previously added contacts from Dynamics CRM, and populate the Item list with values based on the response. 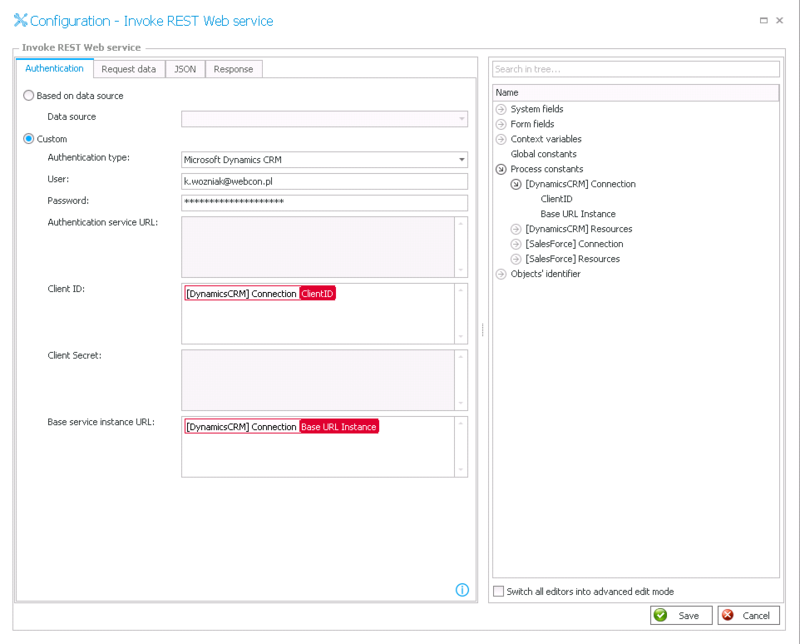 REST action II configuration p.1 – Authentication in Dynamics CRM platform, similar to the previous configuration for SalesForce. 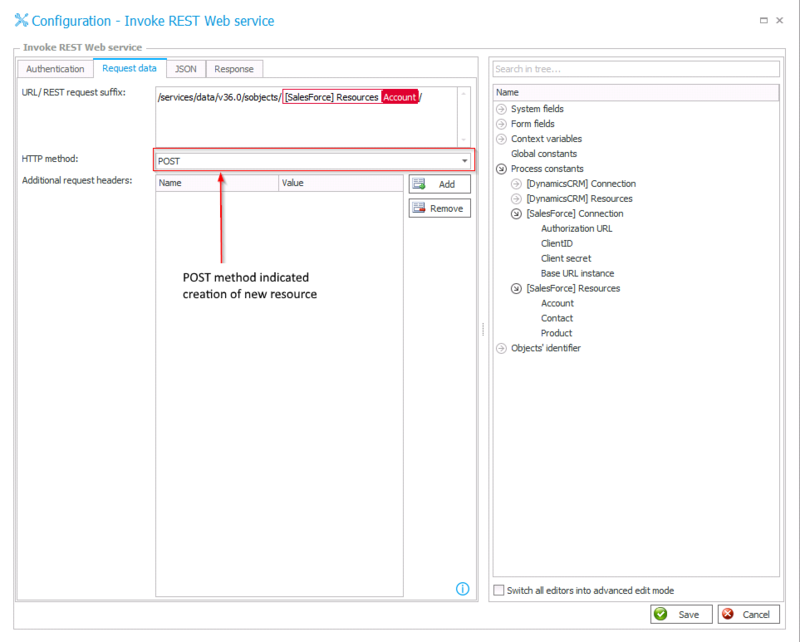 REST action II configuration p.2 – Choosing HTTP method as well as pointing to the specific API Resource. Additionally with a query filtering last 5 accounts and selecting only the specific columns. 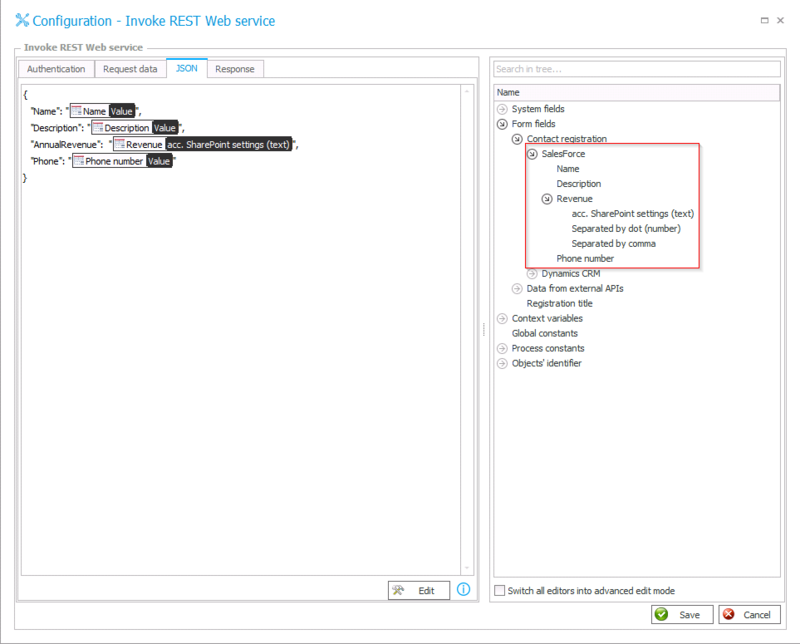 REST action II configuration p.3 – Defining mappings for the data returned by the API. Form fields which will be populated with an appropriate data are selected. REST action II usage – after execution data returned by Dynamics CRM API are populated into Item lists and its columns.